Following the completion of an extensive port dredging project, the arrival of the largest steel ship to ever call to Greenore Port in Ireland represents a new landmark for the port.The cargo vessel Smart Tina arrived in early August from China as part of its maiden voyage. 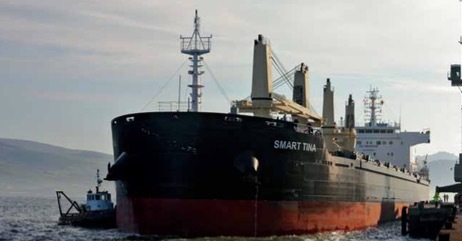 The Smart Tina has a dead weight tonnage of 38,900dwt and measures 180 metres in length. Greenore Port completed an extensive port dredging project in May. Prior to the dredging works being carried out, the port would have been unable to handle a vessel of this size. One of the most challenging aspects of the project was the deepening of the berthing area which is located in a section of the harbour with a rock bottom and strong tidal currents. “Dredging commenced in February and by mid-May we have removed over 7,000 tonnes of rock from the harbour bed,” said Niall McCarthy, General Manager of the port. Greenore Port was purchased by the Doyle Shipping Group in late 2014 and the port deepening project is part of the group's strategic plan to develop facilities at the port. McCarthy commented that the project was an investment in the future of the port. “There is a growing trend in the industry for larger, more efficient vessels which provide customers with economies of scale, it is important that Greenore Port can facilitate such vessels, so the arrival of a vessel the size of the Smart Tina is indeed a landmark,” he said. Greenore Port’s previous largest steel ship was the Ourania, which had a deadweight tonnage of 27,797dwt. A privately owned Irish company, the Doyle Shipping Group's portfolio includes operations in Dublin, Belfast, Cork and Foynes ports. The company has been operating since 1886 when it was founded by D F Doyle.